Winchester RANGER is hard to find and features a jacketed hollow point bullet that expands on impact for maximum stopping power. This ammunition is new production, non-corrosive, in boxer primed, reloadable brass cases. This ammunition is bonded which helps prevent core/jacket separation making this the round of choice when you face a potential deadly encounter. This is top of the line, American-made defense ammo that is occasionally made available to the general public through police trade-ins - it doesn't get any better than this for personal protection. 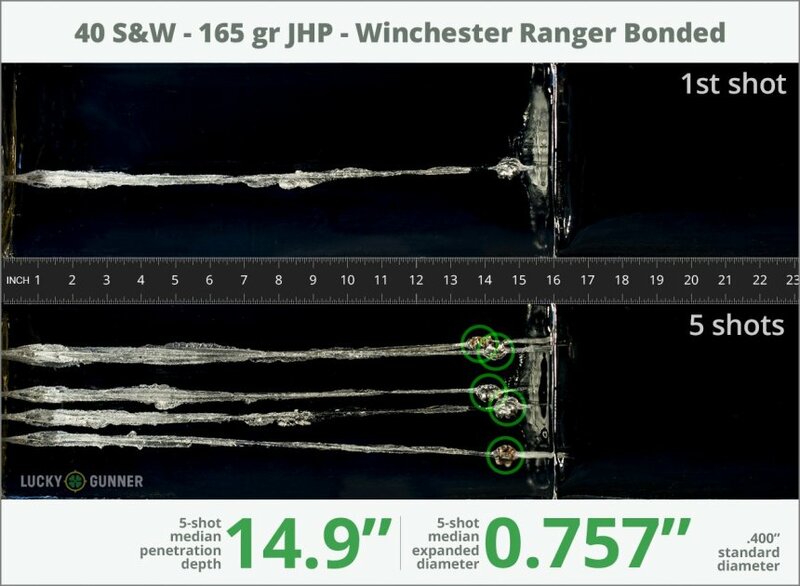 We test fired five rounds of .40 S&W (Smith & Wesson) Winchester 165 gr Ranger Bonded into synthetic ballistic gelatin to observe its expansion and penetration characteristics. The ammo was fired from a Glock 27 pistol at a distance of 10 feet. A four-layer barrier of heavy fabric was placed in front of the gelatin to simulate clothing. How do the results for this Winchester .40 S&W (Smith & Wesson) compare to other 40 S&W Ammo? 0.89" This ammo: 0.757" Min: 0.39" Median: 0.65" Max: 0.89"
14.9" 0" 9.8" 16.5" 32" This ammo: 14.9" Min: 9.8" Median: 16.5" Max: 32"
These have become my first choice for everyday carry in .40 S&W. Consistent performance in all the tests I've found on the Internet. 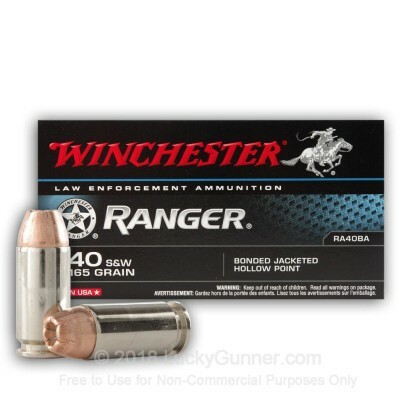 Winchester Ranger is what my local county law enforcement uses! Be careful about a 180 grain .40 S&W Winchester lot ICE removed from duty carry to training use, Q4355. This ammo is excellent all around, and flawless in my XDM. 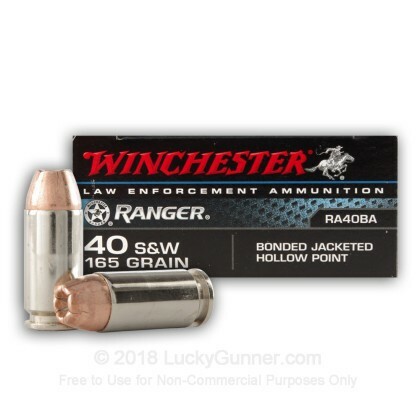 Ranger bonded/PDX1 is grain for grain some of the best ammo out there. Get some, you won't be disappointed. Love this ammo. Love that lucky gunner almost always has it in stock. Got it in .40. Shipped same day got it two days later. Feeds perfectly in my Sig Pro 2022. Great weight retention 163.2gr average of 5 rounds. No jacket separation. And perfect through 3 layers of denim. All around devastating round. Bad guys beware! I have personal experience in the stopping power/ expansion of this bullet. I've shot a box through my S&w shield and just over 3000 rounds in my Sig p229. This ammo performs flawlessly and has never let me down. Great self defense round. Would highly recommend and at the low prices on lucky gunner you can't beat it. I got ahold of some LEO 40S&W T Series 180 grain JHP rounds. Loaded 10 into my Glock 27 and shot at paper just to feel the kick from these loads and there was some more but all were in the 9 & 10 rings at 10 feet. These are the new Black Talons. I'm assuming that these 165gr JHP are just as good but get the T series if you can find them. I am an old guy, former police officer, agent, corporal and other ranks. I currently do mostly homicides for the public defender's office in a very high murder rate city (good for business I always say). I have been shot twice. Once with a .25 ACP, but also in a holdup attempt with a .45 ACP Silvertip many years ago. No comment about what happened to the guys who shot me (once with two of my children present). Anyway, I love this ammo and have shot one box (out of the three I bought so far) out of my Glock 23 Gen4 which is my favorite carry gun while working (updated from a Gen2). The ammo fed perfectly, felt good (nice punchy feeling), hit consistently within a couple of inches of target center and most importantly to me, gives me a really good psychological feeling that I could not have picked better. I also like Gold Dot 165 gr JHP equally as much. Whichever is available I buy when I need ammo. PS: I know the FBI uses 180 gr. PDX1, but they are more likely to have to shoot through heavy barriers. I like this ammo better for general self-defense. Not T-series, but still really good! I shot a few rounds thru my G22 and Sig 229, its worked fine in both. Recoil is pleasant, but these pack one heck of a wallop. These are now what I use for personal defense. I will say this, though. They aren't t-series bullets. They expand just like the PDX1 bullet, which is still a really good bullet. So you can know what to expect, its a mucho premium bullet made much more affordable by bulk packaging. I can't say anything bad about them. This ammo fed equally as well in my S&W Sigma and Springfield XDM. I can't speak for actual stopping power as I have only stopped inanimate objects but the penetration and expansion give me confidence that it is a real stopper. I feel all ammo is overpriced in today's market but the price per round was competitive and the delivery was expedient. Ordering was easy enough. Just out of curiosity, I fired a round of this ammo using a Glock 27 through two water-filled plastic laundry soap bottles in front of a 3/4" plywood backstop. When I examine the bullet, all six talons had deployed uniformly and the expansion was remarkable. No better self defense load available. Bonded is The Only LEO left! This is a great round. Performs as you would expect any Winchester Brand to do. Feeds great, accurate, penetrates very good. The "T' series was the best for stopping power!!! The FBI or Winchester chose not to sell these rounds to "civilians" because they were so closely related to the "Talons" of yesteryear! 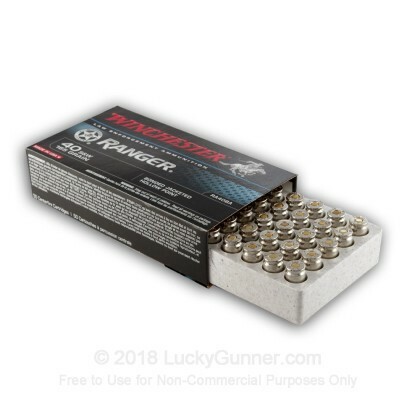 This ammo feeds flawlessly, is accurate and expands better than any hollow point i've ever tried. I shoot it in .40 Cal and Sig .357 out of a Glock 23 with 5 inch ported barrels. As for value, you can't beat the price. When things go bump in the night, I want to be the "Lucky-Gunner." Q: I can't find these anywhere. Has Winchester rebranded/renamed or discontinued these? A: Hi Terrance, I haven't heard anything from Winchester regarding these being discontinued. Our purchasing team is working hard to get a new shipment in.